One of the tests of mettle for any group was the ability to form up and tackle some of the toughest creatures in the galaxy. Besides the powerful krayt dragons of Tatooine, the kimoglas of Lok were also formidable foes. Lok was a particularly treacherous world where a circuitous route was needed to safely reach a destination without being overwhelmed by the high-powered fauna or even the pirates and other NPCs that trekked about. V-Squad was running on as full a group as possible, complete with factional pets, creatures, food and probably a bit of spice for that extra boost. But try as we might, there was no sign of any kimogila. Sure, we knew there was the large volcano, but we were interested in a hunt... not suicide! A sandstorm started to blow through, and rather then continue partially blinded we decided to set up camp and prepare for the next session of the trek. I don't recall who first saw it; maybe we all did about the same time. 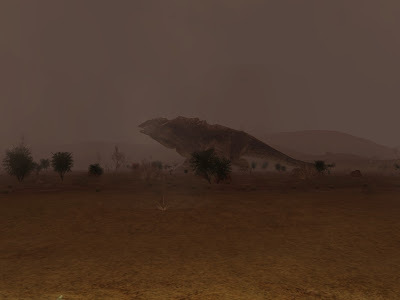 But through the biting winds and sand, we saw our first kimogila. The picture above captures that moment. It was far bigger then we had anticipated, and far more powerful looking. But we didn't come all that way to take pictures. Steeling ourselves, we got down to the task before us. I remember first sending in my giant torton, Thunder, and hearing Nikki yell out "We have our own giant monster, too!" to the unimpressed kimogila. Thunder provided only a slight distraction, but if I recall correctly we were successful and took down a few more of the giant lizards before wounds and fatigue forced the hunt to an end. Cyra vowed to someday acquire kimogila DNA for her bio-engineering. She did succeed, but it was not an easy undertaking. I still have the fruits of her labor to this very day.